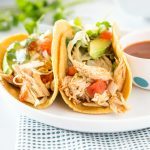 Fajita Chicken Quesadilla – Chicken fajitas are a classic Mexican food, turn them into an easy dinner with these chicken quesadillas! My family loves Mexican food, that is nothing new. There are a million recipes on the blog already, but there can always be more! 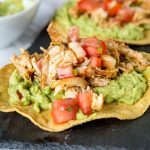 Chicken Tostadas are one of my go-tos for sure on busy nights. And if you can have chips and guacamole with it, then we are all on board for sure. 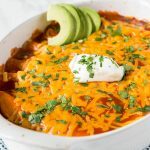 Mexican food doesn’t have to be complicated, I am all about an easy dinner. 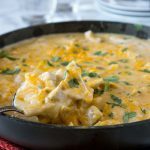 Mexican Skillet Potatoes is a great last minute idea using ingredients you probably already have on hand. When we don’t have dinner planned and aren’t sure what to make, often times chicken quesadillas are what we make. We always have the stuff available, and everyone can put the toppings and fillings they want. 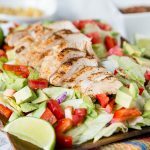 A few weeks ago I shared with you my favorite Easy Chicken Fajitas recipe. 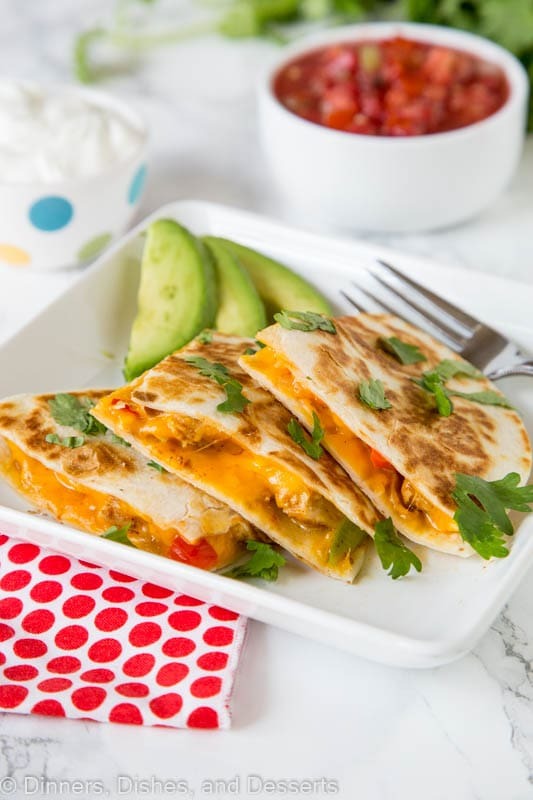 These quesadillas are the perfect thing to do with the leftovers! 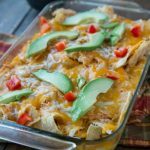 Just chop up some of the chicken and veggies, place between tortillas with plenty of cheese. Couldn’t be easier! Or just make them because and eat them the day of! 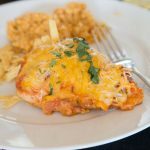 Serve with Mexican Rice on the side for one tasty meal. 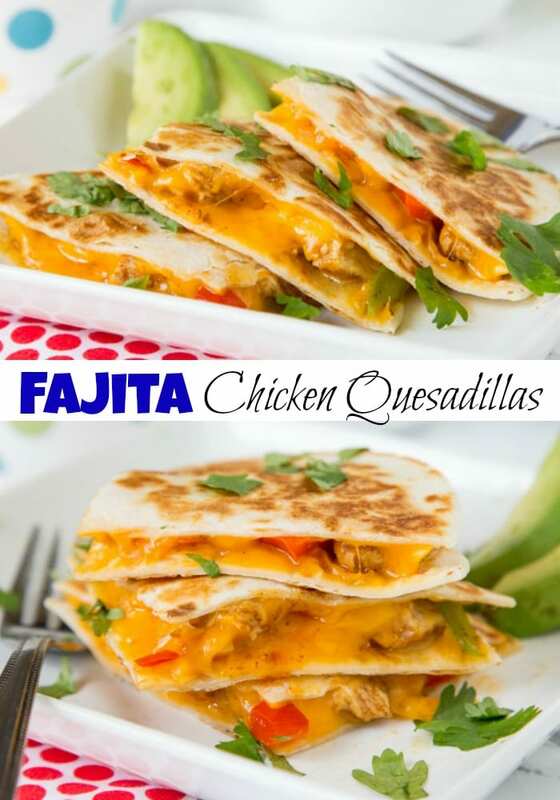 This chicken quesadilla recipe is pretty basic and you can mix it up how ever you want! I like to add black olives and diced tomatoes to mine. My husband likes to add banana peppers to make it spicy to his. So they are super easy to customize and make your own. Serve with salsa or guacamole for dipping. I like to use flour tortillas for quesadillas. You want to use a griddle or a large skillet. If I am making them for the whole family, I break out the griddle so I can make them all at once. How big you want them totally depends on the size of tortillas you buy. You can use the big burrito tortillas and fold them in half with the filling in the middle, or use the small taco size and stack them. Whatever works for you. For the best results you want to put cheese on the bottom tortilla then add your fillings and top with more cheese before placing the top tortilla on. This way when it melts everything sticks together and it doesn’t fall apart. Adding a little oil to the pan and brushing both sides of the tortilla with oil helps get the tortilla super crispy and golden brown as well. 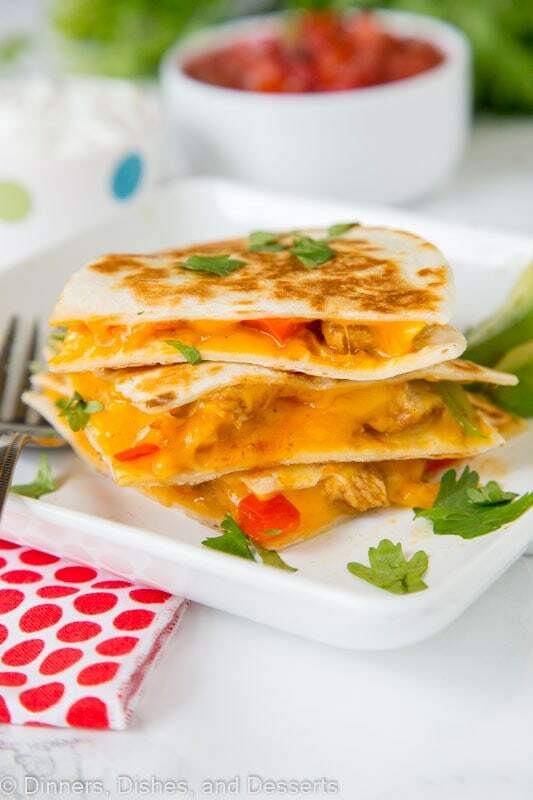 If you are looking for an easy dinner a chicken quesadilla can be on the table in minutes! 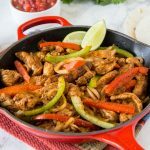 This fajita version uses easy chicken fajitas as the base. I use a homemade fajita seasoning recipe to season the chicken. It is super simple with just basic spices, but gives the chicken great flavor. There is just something about fajita seasoning that is so good! Slightly different that taco seasoning, but similar flavors. 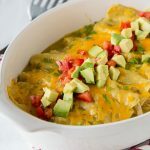 Tortillas last forever in the freezer, so you can have the stuff on hand to make these almost any night of the week! And who doesn’t love all that gooey, melty cheese for dinner? So the next time you are thinking taco night, mix it up! 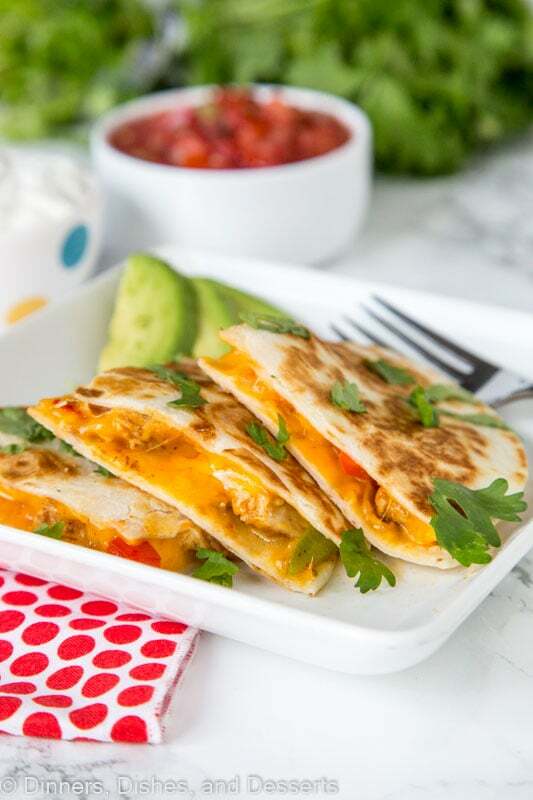 Chicken quesadillas are super easy to make and they are always a hit. 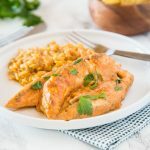 Fajita Chicken Quesadilla - Chicken fajitas are a classic Mexican food, turn them into an easy dinner with these chicken quesadillas! In a small bowl mix together the fajita seasoning mix until well blended. Toss chicken with the seasoning mixture until well coated. Heat a large skillet over high heat. Add 1Tbls oil to the pan swirling to coat. Add the chicken and vegetables to the pan. Cook for 5-6 minutes, stirring frequently. Once the chicken is fully cooked remove from pan coarsely chop. Lay 4 flour tortillas in front of you. Spread about 1/4 cup of cheese over the top of each tortilla. Divide chicken filling among the tortillas. Top with the remaining cheese. Cover with a tortilla. Heat a large skillet or griddle over medium high heat. Brush tortillas with oil, place oil side down in the pan. Brush the other side with oil. Cook for 3-4 minutes until cheese is starting to melt and tortilla is golden. Flip and cook for another 3-4 minutes. Remove from heat and slice to serve. 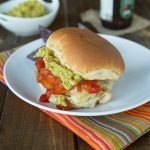 Serve with salsa, sour cream, or guacamole. These are going to make an appearance at our happy hour this weekend! 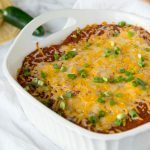 Im thinking that melty cheese with the fajita chicken will be perfect along side a beer and it looks easy enough I wont have to spend hours in the kitchen! #winning! mmm is a light and wonderful dinner for me. That looks mighty tasty! I can not wait to try it. Yum! Fajitas and quesadilla are both family favorites, combing them should have been a no-brainer. We’re going to love these. Yum!! Perfect way to use up leftovers! This is the kind of lunch I need! Easy, quick and tasty! These are going on next week’s meal plan!! 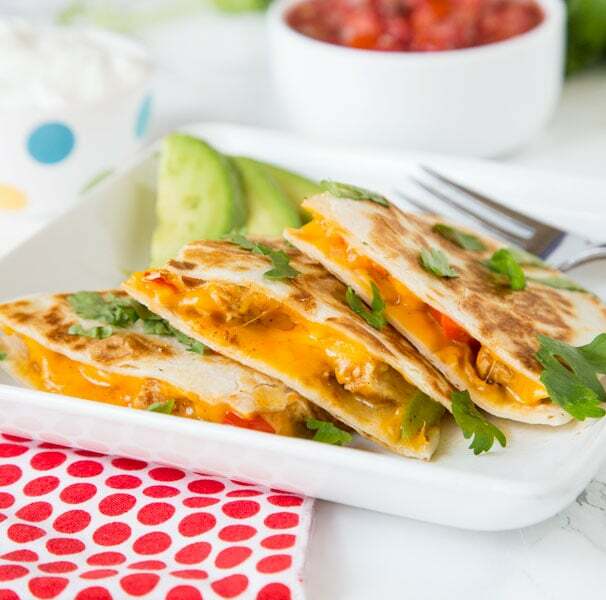 These cheesy quesadillas are perfect for a busy weeknight – my family absolutely loves them! Quick, simple, and tons of flavor! So yummy!! Thank you so much!! Yummy! These will be perfect for the last few outside dinners the family can have while it’s still warm! Those look soooo yummy and just look at that delightfully oozing cheese! 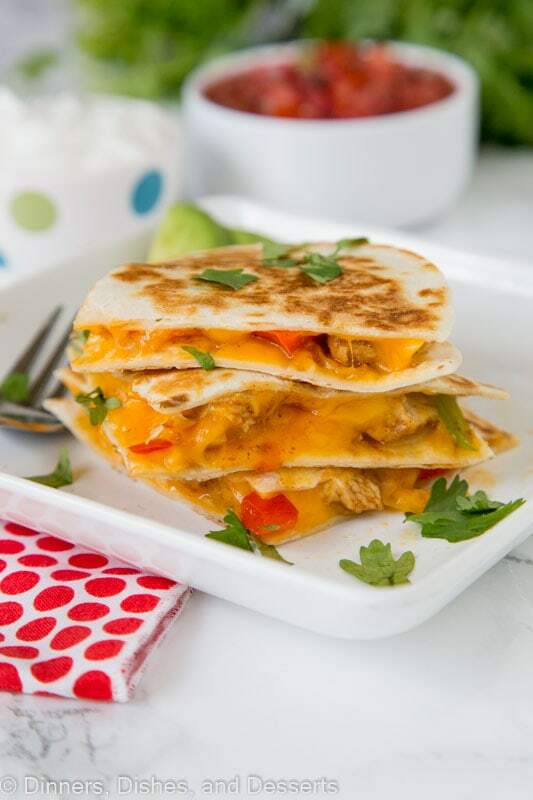 We love quesadillas at our house, these look so tasty and love the addition of chicken. Thanks for sharing this. These are going to be a big hit at my house!